Running with a group can be more fun than simply training on your own. Making running more social can help provide the motivation to run further and/or faster. 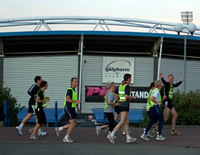 Stadium Runners provide an opportunity to train with a friendly group of runners over a wide variety of local routes. Where and when do the Stadium Runners meet? We always try to provide as much variety as possible in the routes, we rarely run exactly the same route twice, although there are a number of favourite classic runs! During the summer months runs include sections of footpath, bridleway, canal towpath and other off-road traffic free routes. In the winter runs follow well lit roads for safety reasons. I'm not sure if I'm fit enough to run with a group? If you are able to run for about 30 minutes continuously, either outside of on a treadmill then you should have no problem running with us on a Monday or Thursday. If you are not yet at a point where you can run for 30 minutes please contact Saul (details below) who will be pleased to discuss how you might improve your running fitness. This is a common fear, particularly when running with a group. The club has three training groups known as Bronze, Silver and Gold. Selecting the most suitable group enables you to run with those of a similar ability, whilst providing an appropriate challenge. Whichever group you run with no one gets left behind, as those at the front wait at pre-arranged points or run back to join the group. For more information on our training groups, see our Training Nights page. I fancy having a go at a race, does the club compete? 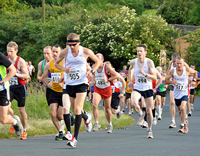 Many Stadium Runners enjoy competing in events ranging from local road and trail races, to fell races, triathlons, adventure races and marathons. Whether you are a seasoned racer or training for your first 10K, most runners find races more enjoyable with a few friendly club mates around. Whatever the event Stadium Runners enjoy a reputation for vociferously supporting each and every one of its members across the finish line. Stadium Runners hold two season long competitions based on a calendar of specific events. The Club Championship uses the internationally recognised WAVA system to make direct comparisons between the race times of runners of different ages. The WAVA system is particularly suited to a club like Stadium Runners with a diverse range of runners at various stages of their running careers. By contrast the Grand Prix is a “first past the post” competition designed to recognise the fastest male and female runners over the course of a season. In addition to the formal competitions the club also organises a number of themed runs, fun events, handicap races and social occasions throughout the year. No problem, there is no pressure or expectation on members to take part in events. 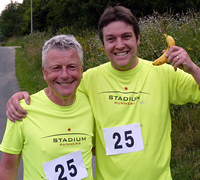 Stadium Runners is based upon a recognition that its members have a wide variety of motivations for running. Whilst for some these motivations may be competitive, others see running as a means of improving fitness, achieving personal goals or even as a way of meeting new people and making friends. Whatever the motivation all Stadium Runners share a belief that running can draw individuals together, create something unique and offer much more than simply running alone.